Hello everyone! It truly has been such an amazing trip so far. As you can probably tell from other blog posts we have been very busy everyday. I’m going to go back a few days to Tuesday when we visited the Cardiac unit. Now first image what a cardiac unit looks like in an American Hospital. 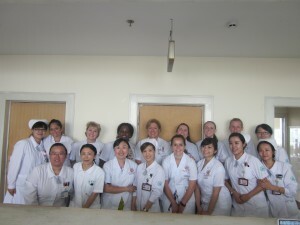 Then throw that image out because it is nothing like this Cardiac unit at the Qilu Shandong University Hospital. On this unit there was a 1 to 8 nurse patient ratio. 1 to 8 CRAZY right?? And to top off the fact that each nurse has 8 patients, the is no AIDES to help the nurses. The nurses do EVERYTHING! They also believe in patient centered care, as we do in the states, and they spend about 50% of their time with the patients, which sad to say, from talking to others in my group who have been nurses for years probably spend maybe 30% of the time with patients in the US due to all of the documentation. Another large difference I found is that this cardiac unit does not have any cardiac monitors that show at the nurses station. So NO telemetry monitors at the nurses station. If someone needs to be on a monitor you can only see the monitor if you are in the patients room. I guess it makes since why they see the patients so much because there is no alarm system that goes off if someone goes into a life threatening rhythm. There is between 3-6 patients in every room, but on this unit there are no curtains. All procedures are done within view of other patients and no one tries to keep up with patient privacy. But no one seems to care, even the patients do not care about the privacy issue. It’s a norm in China. Nurses can ask patients if they can take pictures and will take pictures of themselves with patients and pictures of patients. I asked one of the nurses and she said that there is no equivalent to HIPPA in China, but it’s just known that you do not share information with other people and you must ask a patient before you take a picture. They aren’t worried of getting sued for taking pictures or talking about patients with other people around. Here is something interesting for you all to think about. I watched a doctor go between three patients without washing his hands. I figured because of this there is a high rate of hospital acquired infections, but they told me that they have almost NO hospital acquired infections. I wonder if this is because they do not use a lot of antibiotics, so they do not have as many drug resistant organisms. This is something to look into on whether the fact that in the US we worry so much about infection control, that we overuse infection control products to the point where people don’t have an immunity to these organisms anymore. I also noticed that many of the patients are mostly stable. They did not seem to need any acute help, but more as if they were at a rehab being monitored until they were strong enough to go home. When we saw the ED it seemed as if their ED is more of their acute hospital and then if someone needs long term monitoring then they go to this unit. One last thing that I noticed Is that they did not have many alarms. The call bell was very quiet and it was a soothing chime. Very different than units in the US, where it is so loud and noisy and there are alarms going off left and right. I bet there is probably a lesser rate of alarm fatigue than in the US. The nurses also just seemed so calm and collected. None of them seemed stressed about the fact that they had eight patients and had to medicate all eight of them and had no help from any AIDES. I could not even imagine what they would think of our nurses in the US who are running around like lunatics trying to get all of their work done! Sorry for the long one! I just have so much to say and this experience has been so interesting and eye opening! Let me know if you have any questions! This entry was posted in Uncategorized by nicole_hamel@student.uml.edu. Bookmark the permalink.